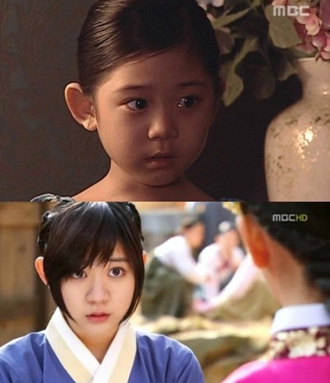 The MBC TV Wednesday and Thursday drama series The Moon that Embraces the Sun has been discussed continuously for days, now the child actors in drama are getting attention. In particular, the look of Seo Ji Hee while acting in previous TV series is been made public, attracting attention of netizens. Seo Ji Hee used to star in MBC TV series My Name is Kim Sam Soon (My Lovely Sam Soon) broadcast in 2005, playing the role of Hyun Bin’s niece. In the drama, the character is suffering from aphasia after the impact of losing parents to traffic accident. After seven years, the current Seo Ji Hee in The Moon that Embraces the Sun still has double eyelids and big eyes, especially she also has a variety of acting activities outside of the drama and is praised.